Celebrate Independence Day early this year with The LINQ Promenade’s patriotic festivities beginning Saturday, June 30. The popular shopping, dining and entertainment district at the heart of the Strip will feature a red, white and blue-themed LED parade, culminating with views of Caesars Palace’s annual fireworks show. Guests may also watch the fireworks show from a High Roller cabin, 550 feet in the air. Click here to book a private cabin In addition, artists will be offering free “body marbling,” turning bodies into psychedelic works of art. Live entertainment on the Fountain Stage will include The Saints of Las Vegas. The party continues on Sunday, July 1, with a parade and family-friendly activities throughout the day, such as balloon art, balloon-toss contests and jugglers. The Saints of Las Vegas will return for a second night of live music. On July 2, Mixed Media Artist Timmy Sneaks will complete a live painting exhibit that will incorporate a vehicle provided by Royalty Exotics. 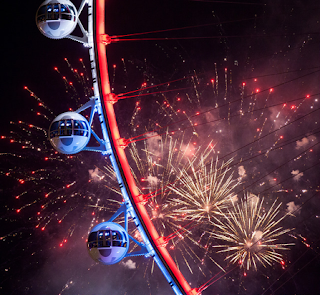 On the Fourth of July, family-friendly activities continue with stilt walkers, caricature artists and hula-hoop performers with the High Roller observation wheel to be lit red, white and blue at sunset. WHEN:Saturday, June 307 p.m. - The Saints of Las Vegas perform at the Fountain Stage. 8:15 p.m. to 11:15 p.m. - Artists applying free “body marbling” near Chayo Mexican Kitchen + Tequila Bar. 8:15 p.m. - Red, white and blue LED parade begins. 9:20 p.m. - Caesars Palace’s fireworks show begins. 12 p.m. to 10 p.m. - Family-friendly activities throughout the Promenade. 12 p.m. - Red, white and blue LED parade begins. 7 p.m. - The Saints of Las Vegas perform at the Fountain Stage. 5 p.m. to 11 p.m. - Timmy Sneaks’ live art exhibition near the Fountain Stage. Sunset - High Roller observation wheel lit red, white and blue.